Ziricote is an edible fruit bearing tree from Central America. 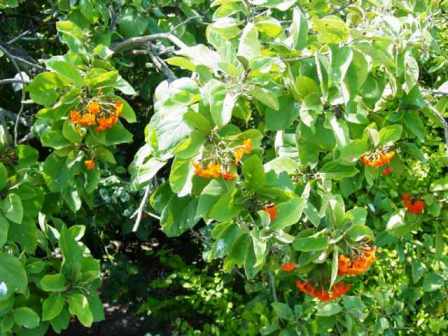 Besides growing wild its trees are also planted in home gardens, especially those of Mayans. This tree is important culturally among Mayan people. Ziricote has multiple uses. It gives edible fruits. It yields a high quality timber. 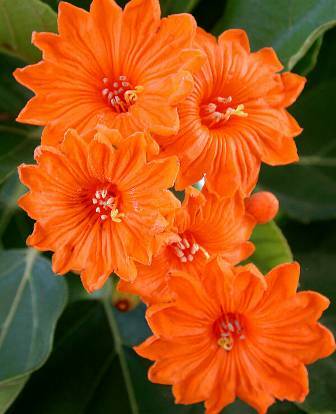 It has a very attractive flower which is also the state flower of Quintana State of Mexico. 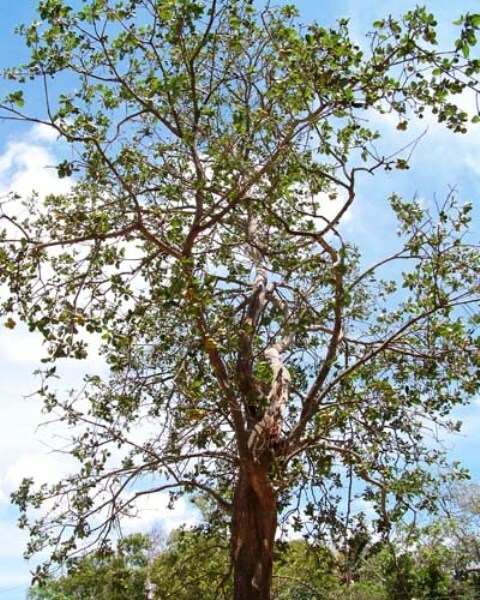 Its trees have been ruthlessly cult for timber due to the population of this tree in the wild has very much declined. Ziricote also grows in Belize and Cuba. A medium sized evergreen tree, 15 m tall, with a broad crown and short trunk. Leaves oblong or sub-orbicular, 6-15 cm long and 4-8 cm wide, rounded or obtuse at the base and apex, margins entire, somewhat sinuate, both surfaces very rough, very stiff hairs present on ventral surface. Flowers borne in cymes and panicles, few flowers in cymes; calyx 1-1.3 cm long, tubular with truncated apex, glabrous or with a few scattered hairs; corolla bright orange, funnel shaped, 3-5 cm long, 2.5-3.2 cm acroos; ovary ovoid, seated on a large disc, style elongated. Fruit a drupe, ovoid oblong with an acute apex, 2-4 cm long. Seeds 1-2, obovoid to lanceolate, laterally flattened 1-1.5 cm long and 5-8 mm wide. The fruits taste sweet and sour and have a pleasantly fragrant yellow coloured pulp at maturity. 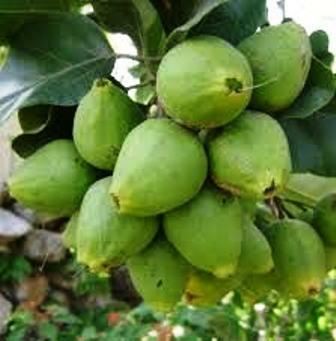 These are eaten fresh and in sweetened form too as sometimes the sour taste dominates the sweet taste. The fruit is also processed on a small scale into a dessert, “dulce de ciricote” by some companies. New plants of ziricote are raised from seed. The seedlings take 4-5 years for coming into bearing. No special technology is involved in growing this fruit.